One of the major issues for iPhone or iPad users could be the iTunes backup completion error. To backup files using iCloud, you need to stay connected with an internet connection. We cannot ignore the security issues of iCloud backup. let’s walk through the simple steps for backing up an iPhone to a Mac with the Best iTunes alternative software – MacX MediaTrans. It’s an alternate iOS file manager to back up your iPhone data. Using MacX MediaTrans you can easily transfer photos, videos, and your favorite music between iOS and Mac without iTunes. 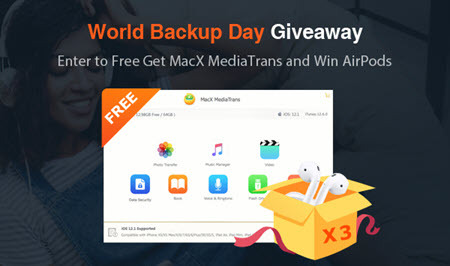 At present, MacX MediaTrans Worlds Backup day giveaway offers free iTunes alternatives tool and a chance to win Airpods. This offer is valid until April 10, 2019. To win, enter your valid Email address to earn one entry of the iPhone sweepstakes and get the Macx MediaTrans license key. To win Airpods what you have to do is sharing the campaign page, downloading MacX MediaTrans, following MacX MediaTrans Social Media accounts and visiting the MacX MediaTrans official site. Don’t miss the chance to win. By using the iTunes alternative tool, you are able to backup and restore iPhone photos, music, videos, ringtone, e-books, and other files. It will back up massive types of data from old iPhone to Mac without data loss. Transfer 100 4K photos in 8 seconds. It allows two-way sync between iOS and MacOS without erasing any data. Quickly recognize and connect to the iPhone without Apple ID. Backup bulky 4k live photos to Mac. Auto convert music to AAC to MP3. Auto converts HEIC to JPG for further use. Encrypt photos/videos transferred from iPhone to Mac or locally saved on Mac. Auto convert videos to MP4. Compress video size to 50% without losing the quality. Large-sized 4K 60/30FPS videos can be saved on your new iPhone Xs/Xs Max/XR. First, Visit MacX MediaTrans Giveaway site and submit the email address in the MacX MediaTrans giveaway section. Now, You will receive an email with download link and license key, install and activate the software using the license key. Then, click the Application folder and connect iPhone to Mac computer (iTunes launches and immediately begins to sync automatically. It prevents to avoid any accidental data erasing). Now, Select the Media files that you would like to backup from iPhone to Mac. 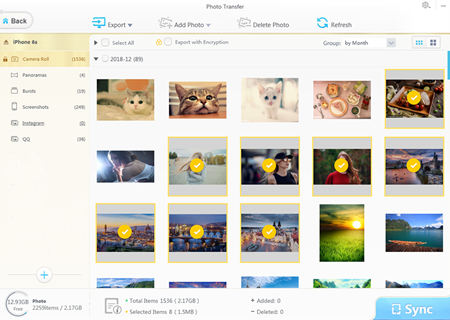 Select the photos from the files by clicking the “Select All” and “Export with Encryption” option. Then click “Export” on the left upper side. Now, the selected data will be backed up instantly. First, You need to connect your iPhone to Mac Computer. Create a new photo album by clicking the “+” button. Click the “Add Photo” button to select media files you have backed up previously on your Mac. Then click the “Open” button. Now, Press the “Sync” button to restore it. If you want to backup iPhone easily and quickly, then I strongly recommended MacX MediaTrans. I’ll tell you what rundown… Just Visit MacX MediaTrans World Backup Day Giveaway page to get your free license and win Airpods by downloading the MacX MediaTrans. Go and check out the powerful backup tool which is MacX MediaTrans by participating in worlds Backup day Giveaway.